The Oakland Museum of California has finished its three-years-plus shutdown of the Natural Science gallery; the new Gallery of California Natural Sciences had its grand opening today. I got a backstage look at it earlier this week and gave it a thumbs-up for KQED Science yesterday. For me the highlight is the gateway section of the gallery, all about Oakland. All except for Oakland (and California) geology. As far as geology goes, the museum’s great serpentinite boulder on the roof, shown here in 2000, is still as good as it gets. You’ll see in the new gallery how Oakland looked 300 years ago: its forests and grasslands and marshes. But you won’t see how it looked 30,000 years ago, or 3 million, or why those times are still relevant today. You won’t get a clue to the underlying framework that explains this landscape, or the deep history encoded there. You won’t see a hint of the active faults that shaped, and continue to shape, our region, nor will you see how they link us to Californiahow all of California is unitedin a tight tectonic embrace. You won’t learn where and why the first Oaklanders dug for stone and gravel and water, or why they stopped. You’ll be able to add your backyard oak to a biome database that maps the ghostly living traces of our original foresta marvelous thing!but not your backyard outcrop or neighborhood roadcut. All those things would have been simple to weave into the plan. The geologic subtheme would have enriched the whole exhibit and made it more truly a natural sciences gallery. Instead the new gallery is stuck, geologically speaking, back in 1969 when the old gallery was built. I’ll keep doing what I can here to fill the gap. This entry was posted on 31 May 2013 at 9:54 pm and is filed under Other topics. You can follow any responses to this entry through the RSS 2.0 feed. You can skip to the end and leave a response. Pinging is currently not allowed. Considering the influence geology has had on shaping the Bay Area landscape, it is a shame that it has been, essentially, ignored at this venue. I wish you success in your efforts in that regard. Good post. Love your blog. Keep it up! And thank you. i can’t think of a better or more qualified person to create an exhibit on the geological history of the area than yourself. i’ve done several native plant gardens at the museum, and would be happy to recommend you, if you’d like. Was there on Friday and made the same complaint. Monterey covers the ocean; Lindsay does birds – noplace does geology. What a missed opportunity. Geology is the real history. Let’s keep bugging them. You’re very kind, Pete, but I don’t see the museum doing anything about this for at least a year. There was a nod to geology in the presentation of the Sutter Buttes, but your point is still valid. It would be cool to have local geology info added to the Oakland section of the gallery. i agree and will pass it on as feedback to the people i know at the museum. 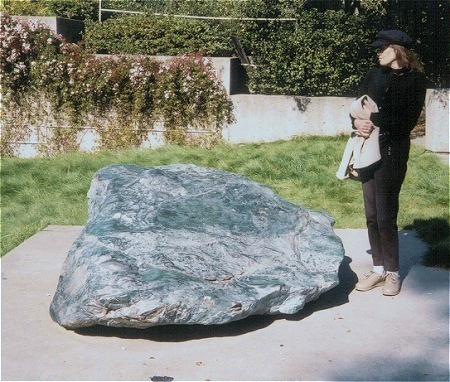 I believe that photo that identified a “serpentinite boulder” at the Oakland Museum of California is actually of the “world’s largest gemstone” as purported in the book by Don Wobber about its recovery. It is a piece of jade recovered by scuba divers from Jade Cove, California. Mike, thanks for that story. BTW I see that your firm did some work on the McKillop slide! FGC didn’t work on McKillop, but I did. As a connoisseur of fine landslides, that one rates right up there. Between the freeways, too! Who wudda thunk?